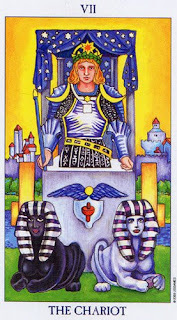 Standing high on his chariot being pulled by two sphinxes, this man radiates power, success and accomplishment. He is “on top of his game” as it were. In preparation of this instalment of Tarotelic we decided that he reminds us a lot of Ramesses II of Egypt, and here is why. Ramesses fought the Hittites in the battle of Kadesh. Both the Hittites and Egyptians extensively used chariots in their battles. Chariots at the time were the best weapons, and only the best of the best became charioteers, much like today’s special forces. Both sides claimed victory but it was in fact a stalemate, resulting in a very clear definition of their borders and balance being restored once again. When this stalemate was reached in their battles an agreement was reached about where the borders of Egypt would be. This resulted in a situation where it was no longer necessary to fight or challenge one another any more. The black and white sphinxes depicted in the card symbolize the balance and equal victory that was achieved by both in the signing of the world’s fist official peace treaty. Ramesses expanded Egypt to the strongest it had ever been and was also renowned for being a great builder. Many monuments were built and erected under his reign. In the Chariot card we notice many tall buildings in the background, behind a high wall that could represent a defined border. Imagine if the two opposing sides did not concede that an impasse had been reached but pushed ahead instead in an attempt to defeat one another. This would most likely have led to defeat and ruin for both. In this lies today’s lesson that The Chariot card brings us. To be victorious in our pursuits in life we need to acknowledge our limitations and then we need all our “horses” to be pulling us into the same direction. If we are instead pulled into different directions in pursuit of success we will soon find that we are getting nowhere very fast. This would lead to self-defeat and non-accomplishment. In order to ensure that we are well on our way towards claiming victory we need to know what direction we are going to be pursuing, and we need to make the necessary compromises or concessions to enable us to travel forward in our chosen direction. Pride and bullheadedness instead may very well trip us up when what is required is for us to know our limitations and to respect our boundaries so that we can conquer new territory within these in our personal pursuits. Because there are certain things in life that do limit us that we do need to accept rather than oppose at our own peril. Once we move beyond pride to see the bigger picture we can recognize that victory can be claimed within the limits that we have set or accepted for ourselves. It is then within these safe boundaries that we can build our proverbial empires and monuments, to become as successful as what we are willing and able to. When we know that all our resources, abilities and instincts are working together to steer us in a common direction towards achieving our goals, we can surely be fearless as we stand aloft in our own self-driven chariots on a path towards glorious success. What creature goes on four legs in the morning, two at midday and three in the evening? The more legs it has the weaker it is. The answer of course is the human! Man who crawls as a newborn on all fours, walks upright on two legs as an adult and requires a cane in old age when his legs are weak. There is a season for all things in the average lifespan of mankind. To know our strengths and to know our limitations will greatly assist us as we move from stage to stage in the unfolding of this glorious journey on earth.